I’d been to this venue back in December when I saw The Railway Children, so I was intrigued to see how they transformed this space - which was custom built as two ‘platforms’ with a track down the centre - from an English countryside train station to Washington Heights, New York City. Although the audience still sit on two ‘platforms’ either side of the rectangular stage, the space is reduced by half for In the Heights, with the set replicating colourful shop fronts at either end of the stage. The proximity of the audience and the fact that the show is performed out at all angles simultaneously, really pulls you into the busy and vibrant atmosphere of this predominantly Dominican and Puerto Rican American neighbourhood. There are patterns and structures in Lin-Manuel Miranda’s score that are unmistakably echoed in Hamilton, but the Latino-infused hip-hop of In the Heights takes a much more spirited and celebrative approach. 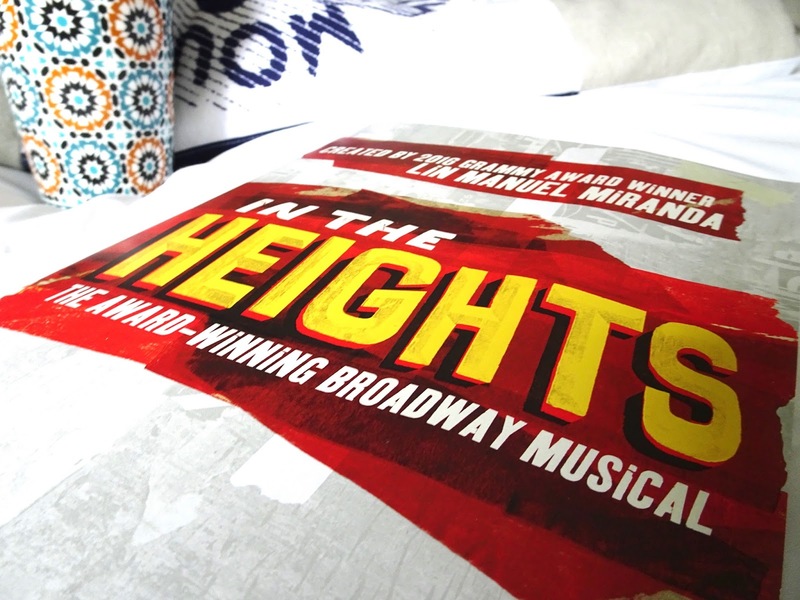 Whereas the rap in Hamilton is innovative and calculated, the words and melodies of In the Heights surround you with a heartfelt nostalgia and utterly contagious energy that is lifted by the vivacious choreography and the cast’s evident adoration for this exuberant piece of theatre. Just as you think you’ve witnessed the ‘big’ number of the show, another comes along that threatens to burst out of the intimate space. Although I don’t really give star-ratings in my reviews, the only factor that would prevent In the Heights from reaching a full five stars is the plot itself. Whilst it’s an undeniably touching story that rests on issues of cultural identity and the definition of success, these conflicts seem to exist as plot devices rather than undergoing any thorough exploration, leaving the unfurling of events a little predictable and safe. The characters, on the other hand, are much stronger than the plot they follow. This is in part due to the charismatic personalities Miranda has scripted into the lyrics and painted into the melodies they sing, but it is also down to the fantastic characterisation from every single one of the performers. In all honesty every member of this cast deserves individual praise, but to name just a few… Gabriela Garcia plays an effortlessly lovable Nina, displaying her upset and struggle caused by dropping out of college with a fierce passion, even if the script doesn’t allow her to dig deep enough into it. Sam Mackay’s Usnavi is both humble and proud, and his episodes in rap are the thread that ties the performance together in the same way that he brings his community together. The whole cast delivers exceedingly impressive and powerful vocals throughout, particularly Christina Allado as Vanessa, who keeps her performance fresh and void of the clichés into which her character, the girl in denial of her feelings, could easily fall.